The holiday preparations are underway in our household. The grocery shopping is done, the menu planned. Although, that's easy - since it's always the same for Thanksgiving and Christmas! However, this year I plan on making a corn pudding that will be baked and served in a pumpkin. The rule is, we are allowed to add something to the menu, we just aren't allowed to remove anything from the traditional menu. The family is expected to arrive later this afternoon, and the celebrations will officially begin. The littlest ones have been busily perfecting a presentation about the Pilgrims and also thinking about what they are grateful for this Thanksgiving. In the meantime, pumpkin pie is cooling on the kitchen counter. This special pumpkin pie always graces our dessert table for the holidays. Quick and easy, it mixes up in a hurry, and helps counterbalance all the calories eaten during the actual Thanksgiving feast. Enjoy! Spray a 9" pie pan with Pam. Beat all pie ingredients together. Pour into prepared pan; sprinkle with additional cinnamon. Bake in preheated 450 degree oven for 10 minutes, then reduce oven to 350 degrees and bake an additional 35 minutes, until set. Remove from oven, allow to cool. Keep refrigerated. Another of our classic family recipes is Byron’s Potato Filling. Only the Pennsylvania Dutch would combine potatoes and bread in this fashion and as the saying goes “They know what good is”. This recipe serves 10 so it is perfect for feeding all the family at the holidays. Leftovers, freeze well and are used to make a turkey casserole to eat in the dead of winter allowing us to taste the flavors of the holidays again. During one of Dad’s election campaigns this recipe was used on the back of his campaign card and even voters from the opposing party were asking for his card! Melt ¼ pound of butter, each, in two frying pans. In one pan, brown the bread cubes until they are crisped, In the other, stir fry the celery and onions until softened and translucent. Mash the potatoes, gradually adding the milk, eggs, salt and parsley. Fold in the cooked celery, onions and browned bread cubes. Pour into one large ovenware dish or two small ones and bake for ½ hour or until the bird is carved. Thanksgiving and Christmas Holidays both feature the same delicious menu at our home. This is a menu that has not changed in my lifetime and for as long as I can remember has been prepared by my father Byron Reppert (age 86). 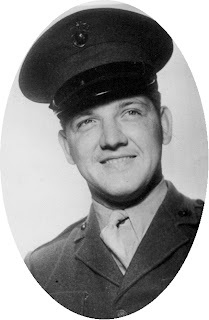 Dad is a WW II marine, member of Mechanicsburg’s Boro Council for 16 years and mayor of the town for 4 years. 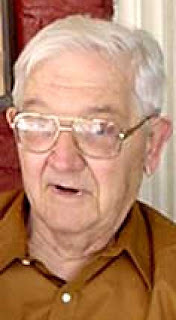 He is one of our biggest supporters in any endeavor we take on. About 3 years ago Dad felt the big family meal might be too much for him to prepare by himself so I apprenticed Thanksgiving Dinner. Our festivities begin on the eve of the Holiday with our traditional Sausage Soup. A prepare ahead meal that can be simmering until all members of the family have arrived. To make this hearty soup use chopped Smoked Sausage cooked in boiling water. Add onion and potatoes to the pot, just before serving add some milk, which gives the soup a creamy color and helps to cool the fat. We have always found the flavor of the smoked sausage offers enough seasoning to this soup. The Senior member of our family usually muses that they used to call this “poor man’s soup but with the price of sausage these days you can’t call it that anymore”. The annual tale continues with “and when we were really poor we made the soup with pretzels instead”. Tomorrow we will have another of Dad's family recipes, his famous potato filling. Yum! It doesn't matter how old you are, everyone likes to play dress ups! On this very special fall evening, we were headed to a colonial dinner to be held at the Frankeberger Tavern in downtown Mechanicsburg. This special event was sponsored by the Mechanicsburg Museum Association . In an annual fund raising event, the museum raffles a complete dinner for 10, and Susanna had the winning ticket! The log house Tavern was built in 1801 by George Frankeberger and served as his home and also offered a comfortable place for animal drovers and other travelers to rest. The building has been restored and now offers a hands-on learning experience and a bit of living history for the community. The museum association inspires the imagination and encourages learning. Our dinner was prepared over an open hearth and served by candlelight. It was a bountiful feast, and those preparing the meal were delighted that we dressed the part, noting that we were the first to do so. It was Susanna's idea to dress up, and we all played along. Her sweet daughter said she 'felt like Felicity', one of the American girl dolls. 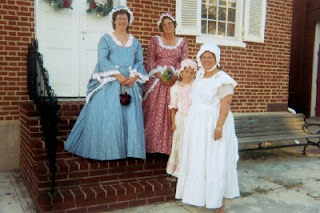 In this photo, we are standing on the steps of Union Church, built in 1825, it was a center for freedom of worship for the townspeople. Today the church is available for private services or weddings. It is also open during special events held in town. Tea sandwiches are an integral part of hosting an afternoon tea. Although the traditional chicken salad or cucumber sandwich might be considered staples, why not serve something a little different. I love to come up with a variety of sandwiches, the filling or the bread can be unique and prove interesting. This individual sandwich plate was recently served at one of our special events. It represents only a portion of the tea party dainties that were served that day, of course there were oven fresh scones and a variety of desserts also. This plate of sandwiches included a basic ham salad served in a crisp phyllo cup, a Swiss cheese apple melt on crostini, a cranberry maple spread on white bread, an asparagus finger sandwich with egg yolk butter (a Martha Stewart recipe), and a shredded cucumber round with a burnet leaf garnish (in the herb garden, burnet mimics the taste of cucumber). The Swiss cheese melt and the cranberry maple spread are recipes from Pat Hartman of Civil-La-Tea, a Gettysburg tea room that has since closed but continues to sell teas and cookbooks on line. I've enjoyed making and serving the recipes from both of her cookbooks. Personally, I utilize a wide variety of sources for tea sandwich ideas including magazines, the Internet, and other tea room cookbooks that all inspire the next plate of sandwiches. Wednesday was another delivery day of organic fresh produce from Spiral Path Farm; therefor, dinner tonight centered around the veggies from the box, and the recipe they so graciously included in their newsletter. Scrub the potatoes, it's not necessary to peel them, and cube into small pieces, about 5 - 6 cups. Slice 2 leeks into thin rings (about half way up the stem to the leaves). Saute leeks in a little olive oil. Add potatoes, 1 Tbsp. salt, 1 tsp. pepper. Cover with water. Bring to a boil and simmer for 45 minutes. Puree about 2 cups of the soup in a blender or food processor until smooth. (Or puree it all if you want a very smooth soup). Return puree to the pot, and gently mix together. Add 2 cups whole milk or half and half plus 2 cups grated cheddar cheese. Stir until the cheese melts. Garnish with freshly grated cheese and a few snipped chives. Serve warm. Enjoy! Written by Bertha Reppert in 1981 and found in the archives of The Rosemary House, this subject is a pertinent today as it was then. “A herb is an erb is a herb is an erb” to paraphrase a certain G. Stein and with apologies to rose lovers everywhere. The pronunciation of this simple four letter word unnerves the most forthright conversationalist. The dictionary gives you a choice in the matter, listing both pronunciations as acceptable. Strangely enough, there is no such controversy about ”herbacesous,” the original root of the word. Here Mr. Webster uses the h and gives us no options. The same is true of herbal, herbalist, herbarium and herbivorous. In each of these the opening h is pronounced, loud and clear, just as one would say Herbert. The Herb Society of America has indeed encouraged the use of the initial h in the pronunciation of its charge. 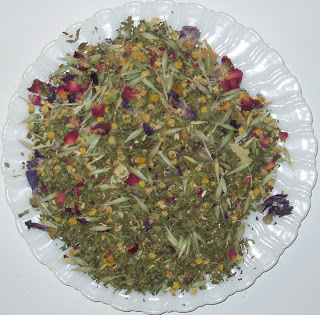 This dedicated organization, so fiercely devoted to the husbandry of all things herbal, gives the word the full dignity of all four letters, saying HERB loud and clear. I have trained myself to say herb with the h. Not easy in the beginning, I’ve discovered it gives the simple little word an explicitness desirable in speaking on the subject and useful to the practicing herbalist. And so, gentle reader, the choice is yours. Say what you will. Join the crusade to adopt the h or drop it as is custom in this land. To me, the important thing is to be aware of these simple little plants, not how you say it. It is enough to recognize their importance to history of man and to know that they are useful today – sometimes in different ways – as they were in the time of Genesis. 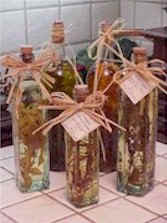 It is easy to make your own vinegar and it is fun to give for gifts as well. Today's post is a quick tutorial on how to make herbal vinegar. First clip what you have left in your garden to harvest. Even though we are well into November, we still have alot of parsley, mint, burnet (cucumber flavor), rosemary of course, lemony lemon verbena, bay leaves, lovage, garlic chives and savory. Next collect a wide mouth jar to put your rinsed clippings into. You don't want to pack the jar tight but you do want it to be full. Next add your vinegar to that. You can use healthful apple cider vinegar, or smooth white wine vinegar, or rice vinegar works also. Balsamic vinegar has such a strong flavor of its own that it seems to work only with strong flavored herbs such as sage and rosemary. 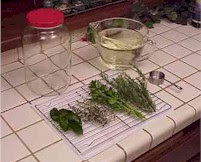 Pour the vinegar over the herbs in the wide mouth jar and let them sit for 2 to 4 weeks. You will be able to tell when it is done as the herbs will turn brown and sink to the bottom. If you use colorful chive blossoms, red rose petals or purple basil, the white wine vinegar will even turn a lovely shade of pink. At the end of the two weeks or the month, strain out the vinegar, bottle and use. 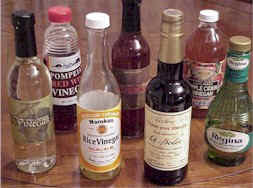 For gift giving be sure to label your vinegar and also add a recipe or two to the gift. If you want, you can add a fresh sprig of Rosemary or Tarragon to your bottled vinegar, but do know that is not where the flavor comes from. 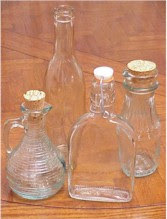 Remember when working with vinegar, that it "eats' through metal rather quickly, so if your wide mouth jar has a metal lid you must put a layer of wax paper between the vinegar and the lid. 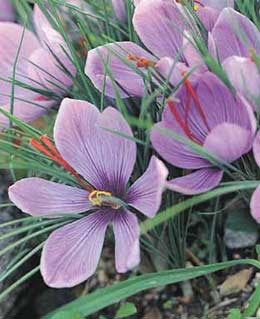 On such a lovely fall day, I spotted the Saffron Crocus beginning to leaf out. A little later into the fall they will bloom and then we can harvest the precious seasoning. Take a peek into my world... this is my kitchen window where I can gaze upon our gardens during the many hours of preparation I spend in the kitchen. At times it is hard to imagine that we are located right downtown in Mechanicsburg, PA, but indeed we are. The view from this window changes with the seasons, but what the picture doesn't capture are the activities of the chipmunks, squirrels and the occasional hawk, the sounds of all the birds (morning doves, blue jays, cardinals and many varieties of sparrows), and the fragrances that fill a herb garden during the year. The gazebo in the far corner provides a peaceful respite when we take the chance to sit and simply reflect. The kids enjoy an impromptu snack or tea party there when the weather is nice. Our garden also has a fish pond with the picnic table situated right beside it. The gardens are actually three distinct gardens, one behind each building, but they do blend one into the other rather cohesively. The garden located directly behind The Rosemary House is a typical English garden with up and down brick paths (placed by our father Byron L Reppert when the shop first opened) and assorted herb beds. The garden behind my home and the tea room, Sweet Remembrances, is considered a low maintenance garden as it consists of raised beds with a large open area in the center where we can entertain guests as necessary. Susanna and David held their wedding reception here on a very hot July afternoon. The third garden is behind Susanna and David's home and is a mix and match garden where anything goes. It has a large hand built wooden fort on stilts for the kids with a sandbox area underneath, there is an antique tub garden, and other fun things like our teapot tree (that's another post in itself). The three gardens form our little haven which we are happy to share with others. The gardens are open to the public from dawn to dusk, and it's not uncommon to see people strolling the gardens, pointing to the bird houses on the barn, or the collection of wind chimes hanging in the tree. Tucked in The Rosemary House garden the whimsical fairy garden can be found, and if you believe, you might even see a fairy playing amongst the thyme plants. And, there is a beautiful tribute bench to owner and founder Bertha P. Reppert, mom, in the Peace Garden. It's a special world out my kitchen window. I'm happy to share it with you! These pretty little plates full of festive fall treats were served recently at our Pamper Yourself Tea. They included a pumpkin shaped shortbread cookie sprinkled with green and orange sugar, a molasses crinkle cookie, and also a mini pumpkin cheesecake with a gingerbread crust. Since this special event was held in late October, these treats definitely featured the colors and flavors of fall. In addition to a full Afternoon Tea, our guests were treated to a five minute hand massage and a five minute chair massage by professionals from the Spirit Day Spa , a locally owned and operated spa. At the end of the day, the attendees went home refreshed and relaxed, their bellies full and their spirits lifted. A combination of tea and pampering, it's a good thing. Last evening we held a special event at the tea room. Treasure Maker Artist Marj. Reppert of Rosemary Remembrances II- Jim Thorpe, Pa presented a Flower Arranging Workshop sponsored through The Rosemary House held at Sweet Remembrances Tea Room on Wednesday November 7th. Marj. a working professional florist during her Kutztown college days shared many florist secrets to help any beginning or advanced floral arranger create fun arrangements for the upcoming holiday season. …Make sure the flowers and greens you start with are fresh. 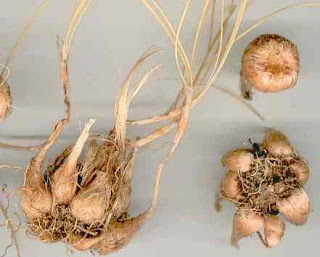 Generally if the flowers are upright, firm to the touch and the buds are tight, they are fresh. …..Most cut flowers should last 4 to 7 days. ….Flowers prefer a cool spot (65 to 72 degrees) keeping them away from direct light helps too. Keeping them away from radiators and the tops of televisions is a must also. ….When arranging your greens, pull off all leaves that will be under water. .....When arranging, do not worry about rules, if you like the arrangement= it is fine. …the best tip: When looking through magazines, clip out and save any flower arranging photos or tips.. tossing them into a file folder or notebook that you can refer to at the drop-of-a-hat for inspiration. Every seasonal magazine has tips or just a great picture or two to reference. ….Have no fear and have fun….”Take time to smell the flowers”. The leaves are blowing off the trees! Every Wednesday we are a host for boxes of gorgeous fresh picked organic veggies from Spiral Path Farm, one of our local CSA's (Community Supported Agriculture). Spiral Path delivers a about 70 boxes here for their members to pick up through out the day. Each box is chock-a-block full of a wide variety of veggies and herbs. This week we got carrots, onion, cilantro, the sweetest sweet potatoes, the last of the peppers, washed spinach salad, lacinato kale, washed fall salad mix and acorn squash. All mouth watering delicious. 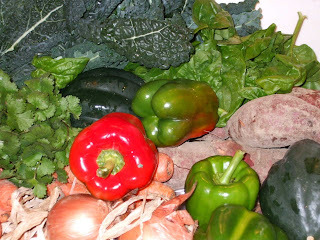 There are a number of CSA's in our area and across the states. Spiral Path Farm offer links to many of them through their website: http://www.spiralpathfarm.com/. Farmers Mike and Terra Brownback also shared this recipe with us. Cook the bacon in a large skillet over medium heat, until crisp, about 5 minutes. Drain on a paper towel, then crumble or break into pieces: set aside. Drain all but about 2 T of bacon fat from the skillet. Add the squash and garlic to the skillet and saute over medium heat for 3 to 5 minutes. Stir in the broth and salt. Cover and simmer, stirring occasionally, until the squash is cooked through and softened, 20 -25 minutes. Add half the goat cheese and stir well to combine. Place the cooked linguine in a bowl. Stir the sauce into the linguine and toss well to coat. Drizzle with the olive oil and add reserved bacon, the remaining goat cheese and the pepper. Serve immediately. Yummy! Rosemary Gladstar our instructor on Herbs for Longevity and well-being is a true testament to "saging" well. Beautiful, healthy and vibrant, I take to heart any information she can give on this subject. While she spoke on a wide variety of herbs and their actions to promote longevity and aging well. It was her recipe for longevity balls, or zoom balls if you add the herbal stimulants, that everyone left the lecture talking about and eager to try. This recipe can easily be changed and adapted to suit your health and taste buds needs. Mix the tahini, nut butter and honey until smooth. Mix in the herbal powders. Add the chocolate chips, coconut and nuts and mix in well. Mix in cocoa powder until you have the desired thickness. Roll into small balls. Store in tins in a cool place. They will last a few weeks. 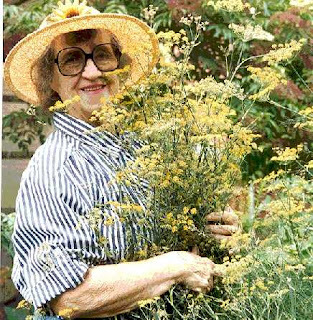 Every fall we host a noted medicinal herbalist, last Saturday we had the honor to have Rosemary Gladstar, author of The Family Herbal, here at The Rosemary House. Rosemary presented an all day seminar on Herbs for the nervous system, including anxiety, stress and the blues. In the afternoon she presented a program on Herbs for Longevity. 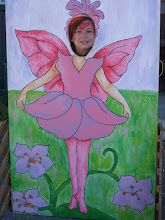 Sweet Remembrances Tea Room provided the delicious fresh, organic, locally grown herbal luncheon. It was truly a wonderful day for all who attended. You can connect with Rosemary Gladstar at her school on Sage mountain in Vermont. She has a wonderful home study course if you are interested, visit http://www.sagemountain.com/. We will blog on her zoom balls and herbs for longevity tomorrow. Hanging on the side of our barn, are two unique barn stars, one is wooden and the other a handcrafted metal star. Barn stars originated from German farmers who would hang these ornaments on their barns. The symbolism behind the star was varied, although some farmers believed they were similar to horseshoes in that they would bring good luck. Other stars might signify the builder, being utilized as a trademark or signature by the builder of the barn. Others simply were used purely as decorations. Although barn stars can be traced back to early America, around the 1700's, barn stars gained in popularity after the Civil War. Originally, barn stars were built directly into the barn during construction, and then later they were made as a separate entity, usually of wood. Today, barn stars are still being made by local craftsmen. The wooden star shown was hand crafted by Fred Will of Somerset County, PA. You can contact our friends Barb & Fred Will via email at sgherbs@verizon.net for information regarding these creative stars. Present day barn stars can be found on homes, businesses, and other out-buildings and are considered a sign of good luck and good fortune. We enjoy the simple beauty these barn stars represent, but will certainly accept any good fortune they may send our way. Overcast and a bit chilly today. Trick or Treat was last night, our gardens were a popular stop. Now that the "Eve of all Hallows" has past, we thought we'd honor "All Saint's Day" by talking about one of the Saints in our garden. Of course we have Saint John's Wort, the terrific wound healing plant for nerve pain and depression. We also have a charming Saint Francis, the favored Saint of birds and small animals. But our favorite is Saint Fiacre considered the patron Saint of Gardeners. Of saints remembered for their connection with horticulture St Fiacre is the favorite of gardeners and herbalists. Born about 590 A.D., the eldest son of pagan Irish King Eugene IV, St Fiacre was reared a Christian by his mother and Bishop Conan of Soder. Tiring of court life early in manhood, Fiacre and his sister Sira journeyed to Meaux, France, where they were welcomed by Bishop Saint Faron and his sister Abbess St. Fare. Admitting his royal background, Fiacre explained his desire to serve God in peace and quiet. Recognizing his sincerity, the bishop gave him a lonely spot in the forest of Breuil. Living the simple life of a peasant, he worked from dawn till dusk making a clearing, raising a cell and chapel, and planting a garden of fruits, vegetables, flowers and herbs. His devotion, kindness to animals and the luxuriance of his garden attracted the attention of visitors from far and near. They brought the troubled, the ailing, the sick and he fed, consoled, cured them, allowing them to work in his garden. So Hortitherapy was born – the first record of helping men’s minds by working the soil. Presently a hospital, monastery and more land for gardening were needed. Permission to expand was readily granted by Bishop Faron, but legend says he could have only what he could encircle with a furrow between sunrise and sunset. Tradition gives two versions: after a night of meditation and prayer her dug a prodigious amount; or , the ground miraculously opened at the touch of his spade. Once more Fiacre set busily to work felling trees, opening trenches, building. All was upheaval when a lady of high degree passed by. Horrified, she hurried to Bishop Faron saying Satan himself was wrecking a private estate. When the bishop investigated a miracle occurred – a stone became a comfortable seat. Again the bishop gave his blessing, ordering all women to keep their distance henceforth. Eventually Fiacre was invited to return to Ireland as king but he refused, and lived out his life in France, praising God and doing good to all men. On August 13th, 670, Fiacre died, but his fame lingered on. For generations French gardeners have observed his anniversary attending services on flower decked chapels dedicated to him. Oddly enough, he is the patron of cab drivers, too, for so many people hired Paris cabs to visit his tomb at Meaux, the drivers adopted him, and their vehicles became “fiacres”.